Trainer Bob Baffert and Garrett Gomez combined on #4 Zensational, who paid $3.20. No matter what bettors gave the most priority to when handicapping this race, they all landed on #4 Zensational. 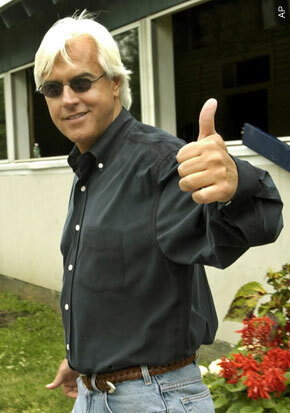 For those who play trainers, Zensational had Bob Baffert. For people who follow jockeys, the rider was Garrett Gomez. Workouts? Six quick ones including three bullets. Breeding and confirmation? The owner bought Zensational for $700,000, so the genes are top notch. Speed? Had the lead in his debut. Even people who bet nothing but gray horses liked him, as he’s a roan. Much like Big Brown in last year’s Belmont, this horse looked so good that he couldn’t be bet. Everyone at the track had him, everyone at the Indian casinos loved Zensational and I’m sure the money was pouring through the windows on him in Vegas. He went off at 60 cents on the dollar, and at that rate Zensational — and horses like him — need to win seven of 10 races to make any money for their backers. If they win six — you lose. And in horse racing, too many things can go wrong to take that price. Yes, Zensational couldn’t lose and he didn’t. His backers will tell you that they made a quick 60 percent profit in just over a minute, and not even Bernard Madoff promised anything close to that. But just enjoy the feeling while it lasts folks, and please do me a favor and keep pounding those 3-to-5 shots. Next time, however, just remember that funny things have been known to happen at the racetrack. My plays in this race were $200 to win on these three horses: #1 Gold Schleiger at 5/1, #7 Off the Wall at 11/1 and #8 Party Hard at 8/1.